I would say that wicket has cheered Anderson up, but not sure it has really judging by his reaction. Eranga plunders back-to-back four off Plunkett, who is persisting with an almost exclusive diet of short balls in search of his 10th wicket in the match. 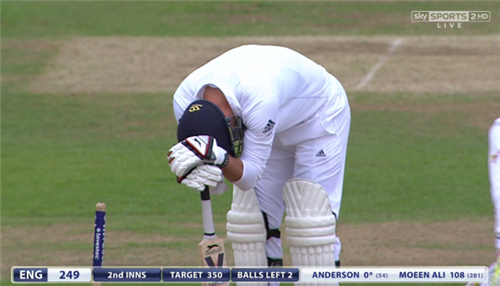 Anderson finishes off the innings by hitting middle stump with a yorker. Sri Lanka 457 all out. England chasing 350 to win match and series. Well, that didn't exactly follow the script for England, who now have roughly 118 overs (it depends on how many are lost today) to chase 350. To put that in context, it would be England's record run chase should they achieve it. Anderson finished with 3-91 and Plunkett took his match tally to nine with 4-112 - but both were totally over-shadowed by Sri Lanka skipper Mathews' brilliant 160. Just got home & flicked the TV onto @SkyCricket interesting day at Leeds ! Going to be a great last day & a bit, thoughts followers ? Bell farming the strike. Plays out the first five of Herath's over before picking up another single from the sixth. [wicket]England have lost their top three as Robson is suckered into a drive outside the off stump and offers a straightforward slip catch to Jayawardene. What an astonishing turnaround. Worth remembering that England secured a first-innings lead in this match with eight wickets in hand. They now need another 300 runs to win and have just seven wickets to play with. Bell somehow survives Herath's over despite playing and missing at one that slides millimetres past the off stump and chopping one into the ground not much further away. How Herath's not got at least one wicket here is a mystery. Joe Root off the mark with a nurdled single on the legside. England's target down to a mere 298 more. 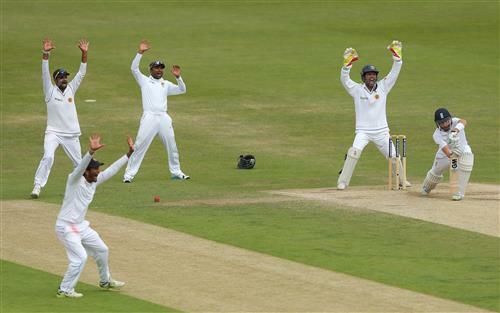 England focused only on survival now against Herath. They're just about managing it. [wicket]What. A. Spell. England's 100 Test man goes as Prasad jags one back through the gate to knock back the off stump. Surely no way out of this for England now. [davidlloyd] Prasad has been terrific, bowling the perfect length. England are all over the place! Here comes the nightwatchman. Plunkett handed the task. And, almost, here goes the nightwatchman. He's given out caught behind first ball by Billy Bowden. That would be a five-fer for Prasad, but he's denied. It's another poor decision from Bowden, the sound was bat on ground not ball. He's not been mutch better than England today. The covers are starting to come off, so looks like we could be on for a prompt post-lunch restart at 1.10pm. Fair to say England aren't exactly going for the runs. Root plays out a maiden from Mathews. 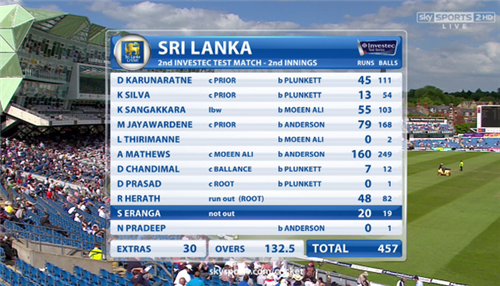 Sri Lanka going for the short-ball tactic that served England so well. Not sure why, although Root is in fairness troubled by a good one from Eranga that makes for his throat before glove gets there first. No short-leg, which is another oddity given the tactic being employed, and Root gets off strike. England will lose this game, in all likelihood, but we will always have this cover-drive from Moeen Ali to soothe our pain. A shot so beautiful that it would make the angels weep. Root unaffected by his contretemps with Mathews, goes right back to blocking like his life depends on it. Now 11 not out off 76 balls. Multi-tasking from Mathews here. Captaining the side, bowling a maiden over, and exchanging curt words with Root between each delivery. Eranga is also getting some shape with the new ball. Not out! Sri Lanka review a caught-behind appeal against Moeen. Umpire Bowden turned it down on the field and replays show the ball flicked his trouser leg on the way through to Chandimal, who made good ground down the leg-side. Sri Lanka down to their last review. Pradeep gets one to rear up alarmingly after taking a piece out of the pitch. Sort of like an 80mph leg-break that goes through at head height and keeps rising. 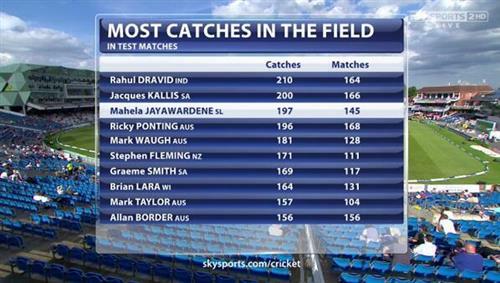 Wicketkeeper Chandimal has no chance of stopping it flying away for four byes. Jordan was fortunate that wasn't straight or it would have taken his head off. There are 30 overs remaining in the match. Jordan is again equal to the task during a maiden from Eranga. Leaving alone as much as possible. Cross another one off. Left-arm spinner Herath into the attack with the new ball only eight overs old. Jordan is gone, lbw playing forward in defence to Herath's arm ball. He reviewed it but Hawkeye confirms umpire Davies' judgment, it was going on to hit leg-stump. [mikeatherton] The ball just slid on and straightened a fraction. The threat of the left-arm spin, in the modern age, is greater now with the introduction of DRS. Broad enters the fray with 28.4 overs for England to survive. There are four men round the bat as Broad gets a big stride in to defend the remainder of Herath's over. Broad turns down a single from the final delivery. Prasad is back on. He's already got five wickets in the innings... Moeen hits the first delivery of the over through the covers for four off the back foot. Another lovely shot from the left-hander, got right on top of the bounce. Moeen keeps the strike with a single to square-leg. Anderson fends a short ball from Eranga to short-leg, where Herath takes a simple catch. What a finish! [wicket]Amazing! The penultimate delivery of the Test match is fended into the legside and Anderson is gone! 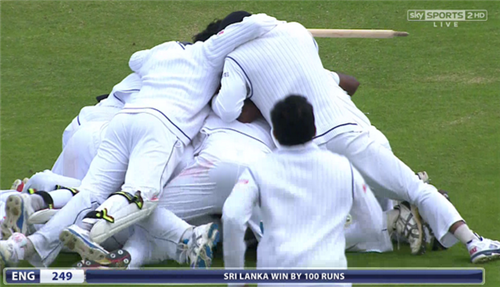 Sri Lanka win by 100 runs. Anderson fends a short ball from Eranga to Herath, who takes a simple catch. What a finish! Cook: "Moeen played an outstanding innings. To get a hundred like that bodes incredibly well for the future. It's gutting to come up short." Cook: "It's a huge honour to captain England and I'm in it for the long-haul. I'm a determined bloke and determined to turn this around."